Welcome to The Duck Republic! 1. You must be a citizen of the Republic. 2. Citizens may choose to nominate themselves or a fellow citizen as Presidential Candidate. Note that the person you have nominated as Candidate MUST CONFIRM THAT THEY DO WANT TO BECOME PRESIDENT. Candidates must provide a small summary of what they plan to do during their time as President. This will happen during the 1st to 4th days of the month. 3. Voting will start on the 5th day of the month and end on the 7th. A poll will be put on this thread for citizens to vote. Only votes from citizens will count. Please refer to War Information ->Duck Army for techs needed by the Republic, multiple vehicles in a role are accepted. Civilian vehicles with no weapons are also accepted if good enough. You must not be a citizen of another kingdom or nation when applying to be a citizen. Citizens may vote to go to war against or ally any nation, as long as they provide a valid reason. An industrial and trading nation, the Duck Republic has enjoyed good trade relations with other Avian States, excluding the GooseSwan Federation. It was involved in the War for Bread, triggered four years ago when the Goose Empire merged with the Swan Kingdom to form the Federation and attacked the wheat farms used to make whole-grain bread unprovoked. Central Lake, where the capital Duckton is located, with spaceports. Inspiration Flats, Celestite and Carbite mining outposts. The Sand Sea, Ignite and Oleite mining stations, with factories located on nearby plateaus. Ice Wastes, with remote Celestite and Carbite mining outposts. The Great Grasslands, Erudite mining stations with numerous farms dotted randomly around the place. Cutler's Valley, a narrow pass with clifftop Rodite mining stations and battery factories. A part of the Quacklantic Sea. Head North to the Ice Wastes. Head West for the Forbidden Lands (DO NOT ENTER, WOLF TERRITORY). Head South to enter Federation space. Birdseed Plateau, plateau with major Rodite mining stations and battery factories. Half of the Sawtooth Mountains. Ended the War for Bread. Has 50 million BB as spending money. Has [REDACTED] in treasury. Has large amounts of resources for manufacturing and trade. Airship, Battleship class: RETIRED. NEW TECH NEEDED. Cruiser: BEING PHASED OUT. NEW TECH NEEDED. Battleship:BEING PHASED OUT. NEW TECH NEEDED. Carrier: NONE. NEW TECH NEEDED. The thread is finally finished! Post AWAY!! 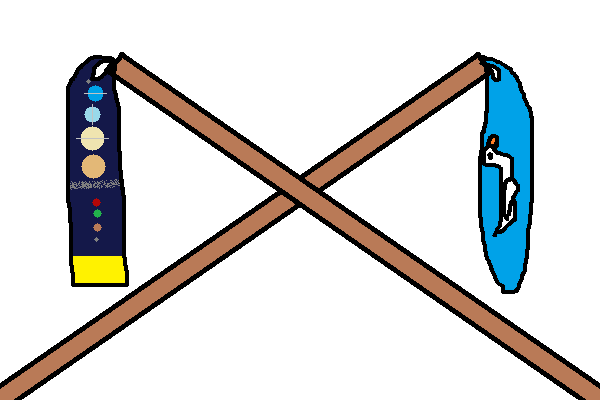 After discussion with the leader of the UESO, we have decided to form an alliance! The Duck Republic is now allied with the UESO! The Duck Republic is currently preparing peace convoys to send to the other kingdoms. We will first visit the (currently named) Legion Region Kingdom as it is closer. The convoy will be sent after the Kingdom has been renamed and we have at least one citizen. The Duck Republic now has an official banner! P.S. Many, many thanks to @Jamie and every other dev involved in making the banner! THE DUCK REPUBLIC IS NOW AT WAR WITH THE KIWI KINGDOM, WHICH HAS ATTACKED OUR ALLY, THE UESO, UNPROVOKED. THE DUCK ARMY IS NOT IN A STATE TO FIGHT A WAR ON TWO FRONTS. WE NEED NEW TECHS AND TECH DESIGNERS. POST YOUR TECHS HERE TO GET A CHANCE TO BE A CITIZEN AND FIGHT OFF THE EVIL KIWI KINGDOM! New war plans have been made. The threat of the Kiwi Kingdom is too large. We must take back Birdseed Plateau from the Federation to gain access to more resources. Scout planes have been sent ahead to scout out the plateau. We will await their return. It seems like the Federation has not sent reinforcements yet! We shall send one Sky Frigate MkII to deal with the defenders! 400MB is far too little, check for the bloated cbs.log issue. Yeah, I know. Turns out the disk had ~1.5GB left after I cleaned and optimized it, so TT works now. P.S. I don't think this issue exists within Windows 10, as when I was cleaning the disk, the Windows Temp files file only had ~270MB of stuff inside, which I guess is normal for a laptop that has not been cleaned since Feb 2016. Goosebump Fighter fires Seeking Missiles! The Fighters form up and attack as one! 220 dmg done to Turret! 150 dmg done to Fighter! CRITICAL HIT! 270 dmg done to Fighter! Birdseed Plateau is now ours! Prototype version of the Skytrain. Can carry 2-3 carriages safely, struggles at 4. Normal version of the Skytrain. Can carry 4 carriages safely, struggles at 5-6. Standard carriage unit. Can carry 8 GEO resource blocks, 6 GSO resource blocks and 2 VEN resource blocks at once. It can probably carry more, but I can't do much testing because the train lags my game. 2. Spawn in number of carriages needed in a line behind it. 7. Charge them and you're done! 5. Land by gliding down. Do not press S! DO NOT HOLD SHIFT. DO NOT GO UP AT MORE THAN A 45 DEGREE ANGLE. DO NOT PRESS S UNLESS ON THE GROUND. Q: Oh no, I'm stalling! What do I do? A: Well, you're done for. You might have gone up at too steep an angle or pressed Shift for too long. There is nothing for you to do but wait for your inevitable demise by falling to the ground and dying. Q: I can't take off! What's happening? A: You might be too heavy! Try reducing the number of carriages or your payload! It is very dangerous to fly an overloaded train! Q: Why is the train nosediving? A: The carriages are misaligned! Don't worry, try gliding for a bit and restarting the engines (No need to press Shift). The train should fly normally again! Q: The train is turning to one side! A: It might be because you did a tight turn! Try turning to the opposite side to realign the carriages. YOU ANIMALS! YOU TAKE OUR BELOVED DEV WHO LEAKS ALL UPDATES CLEAN AND BEUTIFUL! JAMIE! THE LEMON KINGDOM WILL NOT STAND! YOU HAVE WAR! ?! But we didn't force Jamie to join the Republic, he did it willingly! Are you the current leader or...? This declaration of war is too unclear, I will personally ride an airship to visit the Lemon Kingdom and ask its citizens. EDIT: To clarify, this war declaration was not made by the leader of the Lemon Kingdom, which is why I'm unsure. I personally have no grudges over who changes allegiances. The Lemon Kingdom has withstood the tests of time and has endured countless wars. One man does not make a difference. As promised, here is a cheap MBT as a trade agreement. I call it the Turtle.